One of the best things about fall — in addition to the season’s invigorating chill in the air — is the way it makes you want to be snug-as-a-bug indoors. And there’s nothing like the season’s rich palette to warm up a space. The following kitchens wrap their arms around the colors traditionally associated with this season: orange, gold, brown, red and burgundy, all the colors of changing fall leaves. 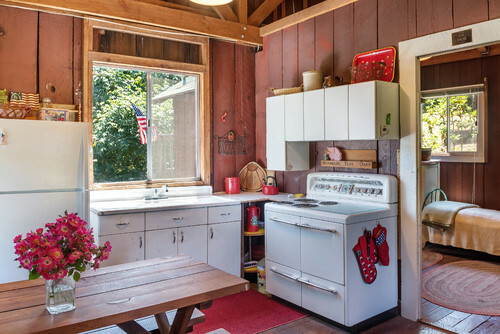 Check out these 14 spaces, and then tell us in the Comments which one you like best. 1. 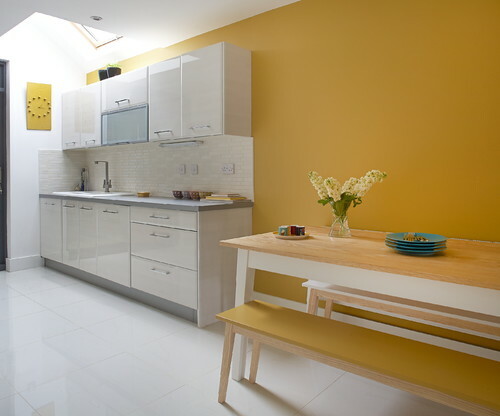 This energizing kitchen in Killorglin, in Ireland’s County Kerry, benefits from a large dose of cheery orange. The space, designed by Meitheal Design Partners, seems virtually guaranteed to wake you up — no morning coffee needed. 2. 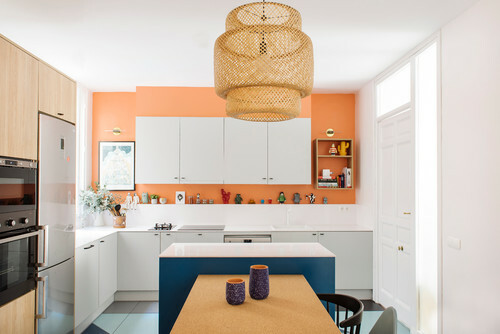 Tangerine walls create a delicate foil to the deep blue hue of the kitchen island in Madrid, Spain, designed by Nimu. White flat-front cabinets look fresh against the colors, raffia pendant and surrounding wood tones. 3. 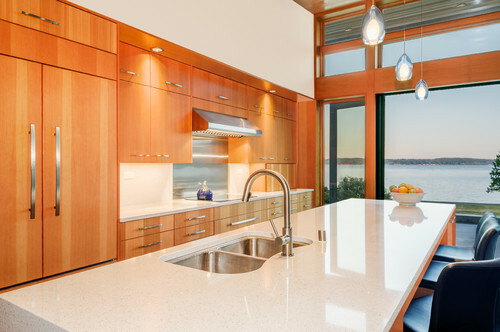 This Seattle kitchen by "Prentiss Balance Wickline Architects isn’t painted any orange shade — but it sure gives off an orange vibe, thanks to the glowing undertones of the cabinets and wooden window mullions. 4. 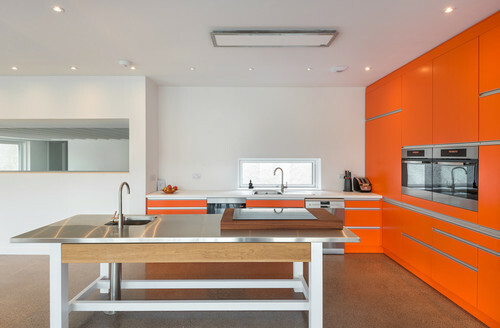 A golden island catches the eye in this concrete kitchen in London by Multiform. 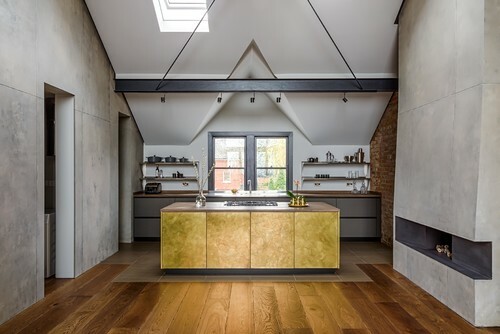 Though it’s relatively small in terms of surface area, the island’s gold hue is the most attention-grabbing feature, followed by the angled rooflines above the window. 5. 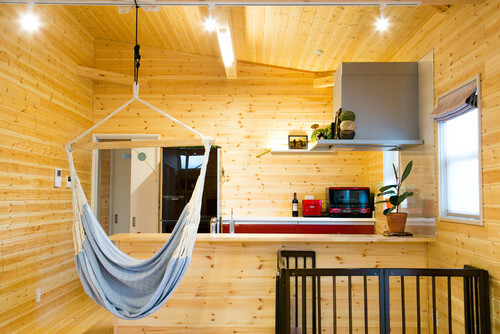 The wood in this Japanese farmhouse emits a harvest wheat color, while the kitchen itself offers a relaxed vibe, thanks in no small part to the hammock seat hanging in front of it. 6. A kitchen space in Ireland keeps it simple, with glossy white slab cabinets and backsplash blended with soft gray counter and toe kick. This kitchen by Ashlene Ross pays homage to fall with a pale mustard color for the wall and dining bench. 7. 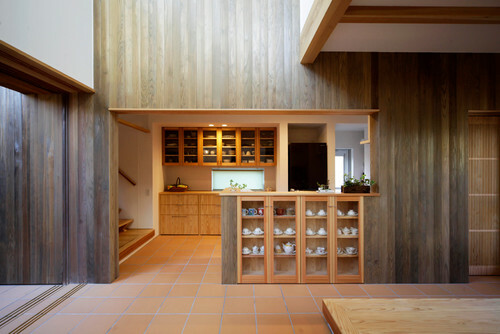 This kitchen in Japan embraces a range of autumnal browns, from orange-tinged wood for the cabinets to a pale chocolate hue lining the vertically grained wood wall panels. 9. 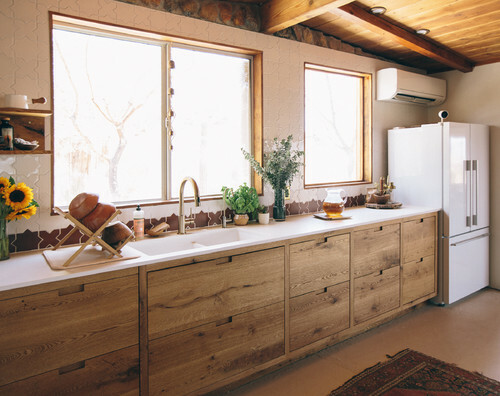 Brown doesn’t have to be boring, as this Chapel Hill, North Carolina, kitchen from Jennifer Gilmer Kitchen Bath shows. 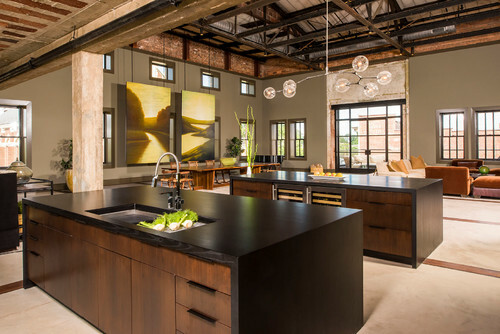 Espresso brown waterfall countertops pair with warm slab cabinets and rustic beams overhead with gray-brown on the walls. The furniture in the background is also in autumnal hues of orange and gold. 10. Red is sometimes forgotten as a fall color, but some of the most dramatic leaves of the season take on a brilliant ruby. 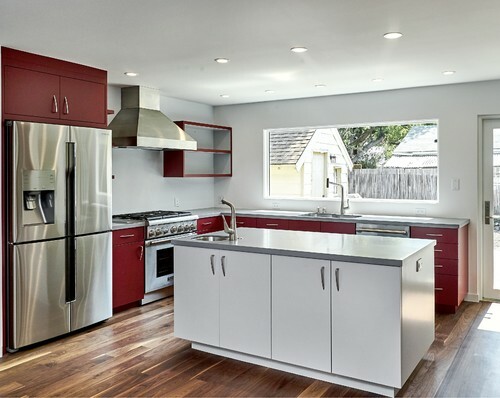 This San Francisco kitchen from Bill Fry Construction features a deep, rich red that imbues this white, wood and gray space with an inviting, welcoming air. 11. This rustic space in the San Francisco Bay Area captured by Brian McCloud Photography features rusty-red planked walls that evoke an old barn. 12. 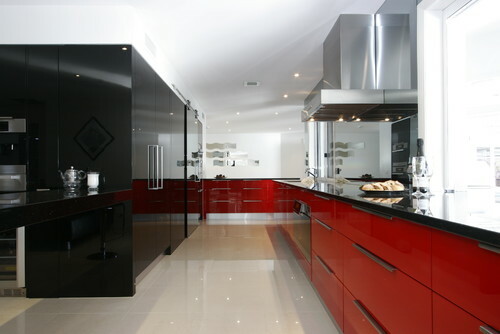 Fire-engine red makes a sleek statement in this Brisbane, Australia, kitchen by Enigma Interiors. Paired with glossy black, the bright red makes for a dramatic color palette. 13. 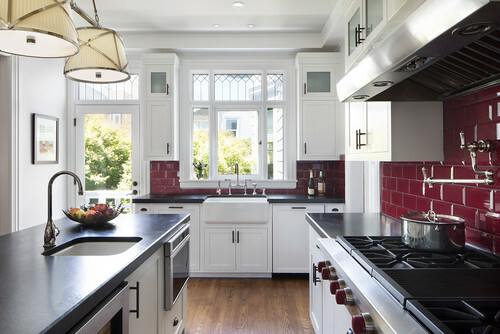 This San Francisco kitchen’s palette is relatively straightforward — wood, white and black — save for the rich berry tone on the wall. Warm raspberry tiles are reminiscent of saturated autumn foliage in this space by John Lum Architecture. 14. 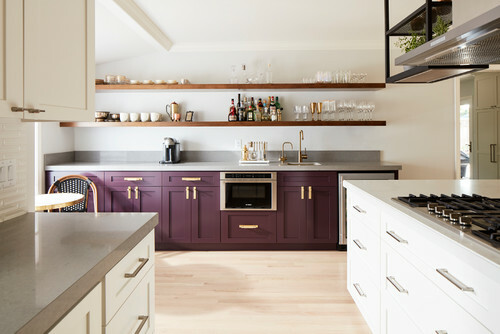 This kitchen’s burgundy tone is more like a cross between wine and eggplant — both great food choices for the fall season.